Buenos Aires, Argentina – December 5, 2013 – Around about the same time every year, Argentinean computer luminaries and CIOs gather to discuss business and technology trends at FinYear – an independent industry event organized by INFOmail iTV, that over the years has become the place to see and be seen. Over 60 sponsors turned FinYear into what has become the most important independent IT event on the Argentinean calendar in a market sector recognised for its dynamic contribution to the economy. Each year, the country’s top CIOs take time out of their busy schedules to get a glimpse of things to come, hear compelling speeches about where they should be investing and share experiences, needs and vision with their peers and vendors. 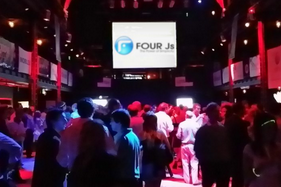 As a lead sponsor with IBM and Nextel, Four Js delivered its vision regarding the emerging market for mobile and Cloud computing applications to an audience hanging on its every breath. Key accounts such as Chandon, Banco de la Nación, Focus and Worknet – to name but a few – all gathered around Four Js marketing specialists Antonella Di Paola (below right) and “Azucena” (below left), in search of more detailed information. Both girls, pre-briefed on FourJs strategy, were keen to serve up ‘disruptive technology’ stories and also pitched in with their own tech-talk to a much delighted audience. Special praise was given for their “same code for iPad or Android” message, cleverly emblazoned across their chests and backs. Never has a FourJs’ message resonated so deeply with a live audience. All the hard work invested in the event paid off as Four Js Development Tools Latin America collected the coveted “Company that by doing a constant effort has reached some of the biggest names in the Argentinean market” award.